Yuck are a rock band that originated in London, England in 2009. The band currently consists of drummer Jonny Rogoff, guitarist Ed Hayes, bassist Mariko Doi, and lead vocalist/guitarist Max Bloom, who formerly played in the band Cajun Dance Party along with former Yuck member Daniel Blumberg. The band's self-titled debut album was released through Fat Possum on 21 February 2011 in the United Kingdom. 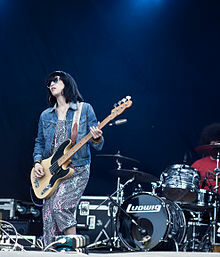 Critics have likened the band to bands such as Dinosaur Jr., Pavement, My Bloody Valentine and Sonic Youth. On 12 April 2012, the band released the non-album track, "Chew" via their official SoundCloud page. On 18 July 2013, Yuck released a new song, "Rebirth" and it was made available for free download via their official website. On 13 August 2013, Huw Stephens debuted Yuck's new single, "Middle Sea" on Radio 1. The new album was revealed to be titled Glow & Behold during an interview with lead singer Max Bloom. It was released on 30 September 2013. On 5 September 2013, Yuck posted a video of a live recording of New Order's "Age of Consent". The video was recorded 30 August 2013 by Michael Lawrence in RAK Studios, along with some other songs. This track would become the B-side to the "Middle Sea" single. New member and guitarist Ed Hayes plays on the track. On 23 January 2014, at a performance in Portland, Oregon, Yuck announced an EP. They played a new song from the EP after the announcement. The Southern Skies EP was released in April 2014. On 8 July 2015, Yuck released their first single since the release of the Southern Skies EP entitled "Hold Me Closer". On 12 January 2016 the band released a new single, "Hearts in Motion", taken from their third studio album Stranger Things, released on 26 February 2016. ^ a b "Yuck – Perfect sound forever". BBC.Sound of 2011. Retrieved 29 March 2011. ^ a b "Yuck for Liverpool Sound city". Clash. Retrieved 29 March 2011. ^ "Yuck Talk Grunge Revival". "Clash (magazine)". Retrieved 25 May 2011. ^ Yuck – Biography at Allmusic, Retrieved 18 February 2011. ^ Yuck – Review BBC, Retrieved 20 February 2011. ^ Facebook update Retrieved 15 April 2013. ^ Yuck - Rebirth - YouTube (Published on 18 Jul 2013) Retrieved 15 April 2013. ^ Yuck - Glow And Behold Previews, trackist, reviews and artwork from Universal UK Umusic.co.uk Retrieved 15 April 2013. ^ Coughlan, Jamie. "Yuck Share Euphoric New Single 'Hold Me Closer'". Overblown. Retrieved 14 July 2015. ^ Coughlan, Jamie. "Yuck Share 'Hearts In Motion', Announce New Album". Overblown Webzine. Retrieved 12 January 2016.